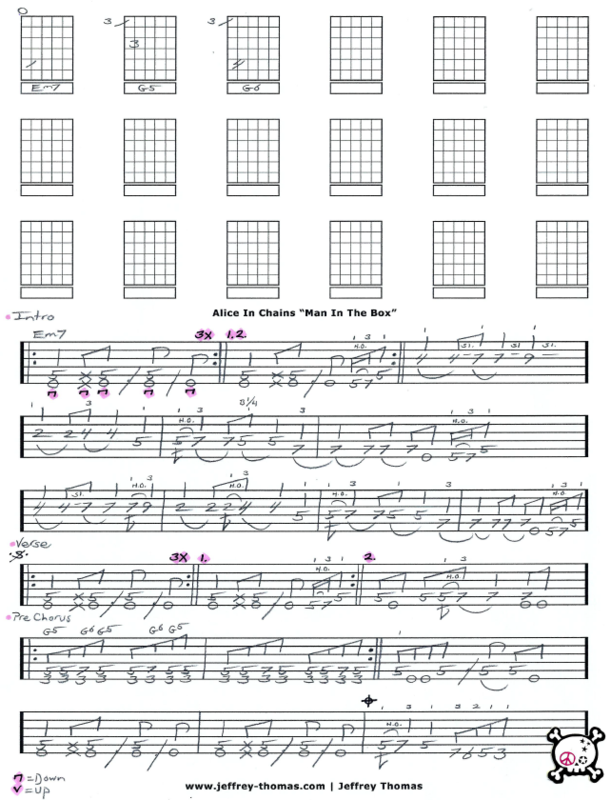 Man In The Box by Alice In Chains free grunge guitar tab. Learn to play classic grunge guitar tune with my guitar tab arranged for one guitar. You will switch from the lead parts to rhythm following the songs structure just as it is on the recording. Included in the tab is the solo and all variations of the main lick. This is one of the most requested Alice In Chains songs by my guitar students. Want the full guitar tab for free? Send in your email address using the form provided. Looking for online grunge guitar lessons? Fill out the Schedule A Free Lesson form to set up a free Skype guitar lesson today. I hope you enjoyed this grunge classic by Alice In Chains. Make sure to check out more free online guitar lessons on my tab, blog and video pages.